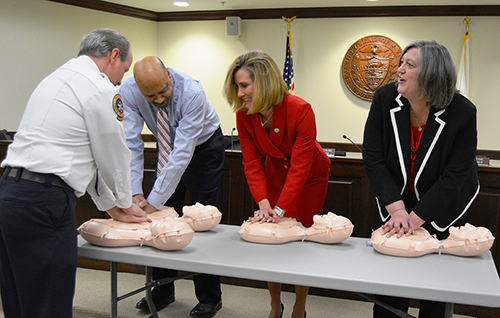 To further emphasize their proclamation of support for American Heart Month, the Chester County Commissioners took time out of their Valentine’s Day Sunshine Meeting to learn the basics of hands-only CPR. The Commissioners also highlighted heart healthy programs and services provided by the Chester County Health Department, and recognized the role of Chester County’s Department of Emergency Services in saving lives, and training others to save lives. At the meeting, Chester County Department of Emergency Services Director Bobby Kagel said, “Most people that experience sudden cardiac arrest at home, at work or in a public location die because they don’t receive immediate CPR. Studies show that bystanders claim that panic is the major obstacle to performing CPR, so the simpler hands-only CPR technique may help to overcome this panic and the hesitation to act. “Immediate hands-only CPR can double or even triple a person’s chance of survival,” added Kagel. Prior to the practical CPR training, the Commissioners were instructed that hands-only CRP training includes three steps: First, call 9-1-1; second, push hard and fast in the center of the chest to the beat of a tune that is 100-120 beats per minute, like the song “Stayin’ Alive”; and third, continue to give hands-only CPR until an emergency service provider can take over and care for the person.